By Jon Gales -- Nokia's 6682 is the new flagship Series 60 smartphone for the US market. It was recently launched on Cingular Wireless, making it one of the most easy to obtain smartphones in America. We got a few weeks of quality time with the handset and have plenty to say. Read on for the full review. Note: The 6682 is the American version of the 6681. Both phones are based off the 6680 which is a 3G handset that won't become available in the US. Any talk of features about the 6682 can be read as if they were for the 6681. Series 60 phones are a lot of things... Except small. The Nokia 6682 continues the trend though not to the degree of some past handsets. The handset is wider than most, see the photos at the end of this review to see this for yourself. For a real-world comparison, it's about a tenth of an inch wider than the Motorola RAZR (which is itself a wide handset--that's one of the reasons that it is so thin). Construction wise the handset feels very solid except for the sliding lens cover which I found cheesy and too thick. There is a silver colored door that holds the memory card in. I found that opening this was a bit tedious, but since you don't change memory cards too often this isn't a big deal. Reaction to the design fell in two camps: love it or hate it. The color is unusual for a phone and is evidently divisive. Personally I think the phone looks sharp, but as they say beauty is in the eye of the beholder. I found the keys a bit small and close together, but after a few days I adjusted and was able to text with pretty normal speed. However I think they could have expanded the keypad somewhat if they made the soft keys a bit smaller--they are huge in comparison to the other keys on the phone. But at least the keypad is in a standard design, unlike some other models in Nokia's past. If you have large hands make sure to play with the 6682 in a store somewhere before buying it. Nokia is known for great reception and the 6682 didn't disappoint. I didn't have any dropped calls and was able to get a signal everywhere I went. Voice quality was very good, both in my ear and on the end (according to my friends at least). The speaker is also very loud which is a nice plus, though my young ears don't need a loud speaker unless I'm in a noisy environment. 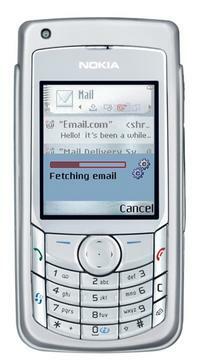 Since the Nokia 6682 is a Series 60 handset it will feel familiar to users of past models. However it's running Symbian 8.0 which many users will have no experience with. The UI has been refined somewhat and there is a new feature that lists a limited number of applications on the home screen of the phone, instead of just blank space (this feature can be turned off though). The great part of Symbian is of course its ability to run third-party applications. Nokia included a few onto the phone (more on this in a bit). If you've used a Series 60 handset in the past you'll dive right in. If not, it will take a little while to grok, but it's a really great platform. Speed wise the 6682 performed well, not blazing fast but compared to some past models very speedy. You can keep several applications open at once so going back into already open apps makes the phone appear really speedy. The camera performs well for megapixel resolution. I'm a bit spoiled by Sony Ericsson's 2 megapixel camera module (that also has autofocus) so I wasn't blown away by the quality, but it's superior to most other camera phones. However, I accidently deleted the photos after sending my unit back to Nokia so there are no example photos attached to this review. Videos are stored as 3GP files and are only limited by available storage. Nokia included a lots of third party applications, but many of them were demos. With a high-end handset it's mildly annoying to open an application and realize that you can only open it a few more times before buying it. One example is software from VoiceSignal that does voice-to-text. However, the Opera web browser was included and it's not a demo. If you're a Series 60 user, Opera is a must. Just a plain great mobile browser. Especially when used with EDGE like on the 6682. Another included application called QuickOffice is able to open popular file formats like Word, Excel and PDF. Syncing over Bluetooth was flawless--I use a Mac and iSync was able to sync without any extra effort on my part. The Bluetooth support in general is robust,--the phone is able to maintain multiple connections (I have heard up to 5) which comes in handy if you're a Bluetooth headset user. USB works as well, though I wish Nokia made the phone able to charge over USB. As a frequent traveler I like to keep extras at a minimum--charging via USB is a nice time saver for me. The Nokia 6682 is a feature packed handset, there are lots of things to like so it's hard to nail down. The screen is great, more colors than previous Series 60 phones I have used, but having EDGE has to be my favorite feature. I'm not too heavy on data, but it's nice to not wait around. In case you were wondering, most of my data use is for stuff like price comparison, tracking flights and reading text only news. Like most Series 60 handsets, the 6682 is a bit larger than most people like. It's not as big of a clunker as the Nokia 3650 (one of the more popular Series 60 handsets in the US), but it's no light weight. The 6682's use of DV-RS-MMC memory is limiting as these cards are hard to find and more expensive than comparable media, especially SD or miniSD. Nokia vowed to begin using SD and made good on that promise with the 3250, but it would have been nice if this had happened earlier. I loved my time with the Nokia 6682--it's a powerful well designed smartphone with a reasonable price. If you are looking for a feature packed handset this handset should definitely be on your short list of considerations. The Nokia 6682 is for sale through Cingular for $299. LetsTalk is selling it for $249.99 after a $50 rebate.